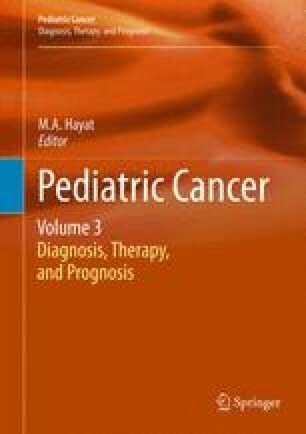 Medullomyoblastoma is a rare embryonal tumor of the central nervous system and is classified as medulloblastoma with myogenic differentiation according to the most recent WHO classification, 4th edition. The tumor cells have neuroectodermal and myoblastic features. The origin of the myoblastic element of MMB remains to be completely clarified. We reported a case of a 3-year-old girl with medullomyoblastoma in the cerebellar vermis. She underwent total resection of the tumor, followed by chemotherapy and radiotherapy in the brain and spinal cord. The resected specimen mainly consisted of densely packed cells with round-to-oval highly chromatic nuclei surrounded by scanty cytoplasm (indicating neuroectodermal differentiation) and focally of long spindle-shaped cells with elongated nuclei and eosinophilic cytoplasm showing discernible cross-striations (indicating myoblastic differentiation). In addition, the tumor cells showed large nuclei with nucleolus, frequent mitoses, apoptoses, nuclear molding, and cell wrapping, indicating moderate anaplasia. Immunohistochemical staining revealed partial expression of myoglobin and desmin as well as synaptophysin and neurofilament in the tumor cells. Some tumor cells showed double immunopositivity for synaptophysin and myoglobin, suggesting the idea that the neuroectodermal cells may undergo differentiation into rhabdomyoblasts.